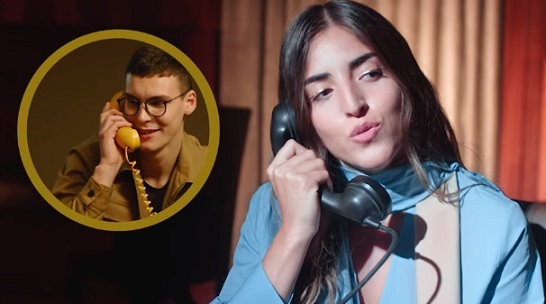 Fendi celebrates Valentine’s Day with a romantic and playful Capsule Collection, showcased in a new commercial by emerging Italian singer Joan Thiele. The ad, set to the rhythms of Joan’s newest single, “Polite”, stars Joan as she goes to a pub to hold a concert. She has her Fendi Mon Tresòr, which is a small bucket bag made of cruise leather with raw-cut edging, that features drawstring fastening and metal decorations in the form of the Fendi logo, two detachable shoulder straps (one long and one short, to wear the bag over the shoulder or cross-body) and gold-finish metalware. Throughout the ad, several models are also seen sporting the leather mini-bag in other hues, including pink, brown, beige, blue, and black. The Mon Tresòr mini-bag is available for purchase in stores and online.